I’ve learned more geography in the last year or two of writing about coffee than I ever did at school. The Kwonggi Mountain Range is, according to the packet, located in Papua New Guinea. The only problem with this new knowledge is that I’m not convinced it’s true. There’s no mention of any Kwonggi Mountain Range – or even a single mountain by that name – in Wikipedia’s list of Highest Mountains of New Guinea; as far as I can make out, Kwongi (with one g) is a small town in the Eastern Highlands, in the Bismark Mountain Range. 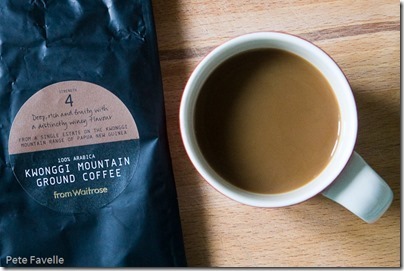 Given that Waitrose seem to be unique in selling a “Kwonggi Mountain” coffee, one could be forgiven for suspecting that their marketing department has made it up a little. Anyway, this is their Kwonggi Mountain coffee. The grounds are rich and sweet with hints of apricot, and slightly overdone toast. Brewed, the fruit is subdued but still present, and the toasted note become more like darkly caramelised sugar. The taste isn’t as sweet as the nose suggested, but it has a nice, slightly citrus fruit flavour with a decent body and a generous but not overwhelming bitterness which feeds into a dry finish. It’s a curious coffee, the flavours letting it down but the body lifting it back up – it’s definitely one that grows on you as you drink it, and I think deserves three stars. Nice to read the review. I used to live in PNG for a few years. The taste of the coffee definitely reminds me of some of my favourite Goroka coffee from the Eastern Highlands – the Eastern Highlands is a very important coffee growing area in PNG. Papua New Guineans are very generous with the use of the word mountain to describe different hills. Also, the highest mountains in PNG are over 4,000 meters high so there is no way coffee can grow in the highest mountains but more in the foothills/ ranges – including the Bismarck range. Spellings of small places can also vary, it is only recently a written language etc. I don’t have a problem believing this coffee is from PNG – and I love it, although I am biased!